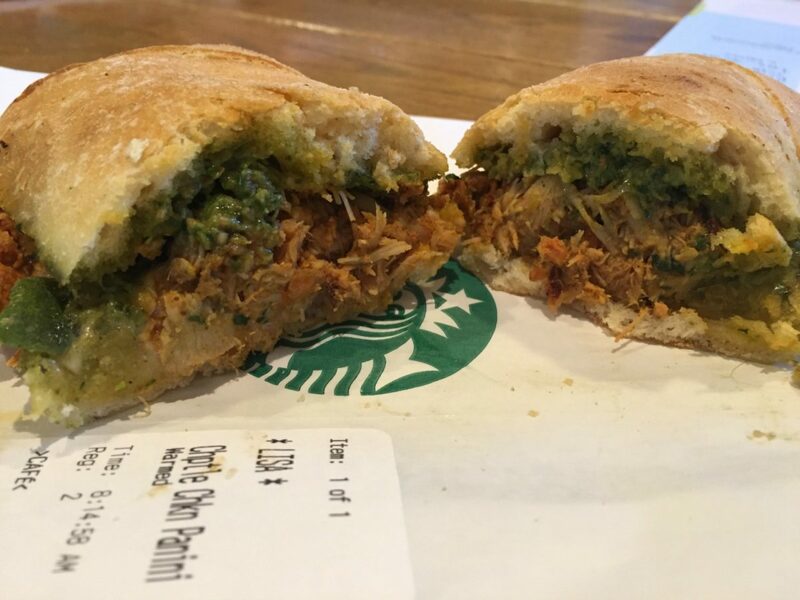 Starbucks introduced two new sandwiches on February 16, 2016. (They may have been available on the 15th in many stores). People are loving them! It’s shown here with the new Citrus Mint Green Tea Latte in the background. This is an actual customer photo: Thank you to StarbucksMelody.com reader Lisa, who sent in both the photos used in this article. Starbucks describes this new sandwich as “Spiced chorizo (sausage), Monterey Jack cheese and a fluffy egg with caramelized onions on potato bread.” In my opinion, the potato bread is much tastier than any of the other breakfast sandwich breads. The next new breakfast sandwich is the Ancho-Chipotle Chicken Panini. This new sandwich doesn’t necessarily fit perfectly as a just a breakfast sandwich. It feels like it could be a lunch item too. Both of the new sandwiches pair nicely with a flat white or a latte. They’re pretty spicy, and the having a milky drink seems to cut the spiciness a bit. I should mention that I’m a spice-wuss. Others will love these two new sandwiches. I think they’re great too, but I just notice that they have quite a kick to them for Starbuckian food! Let me know how you like these two new items. 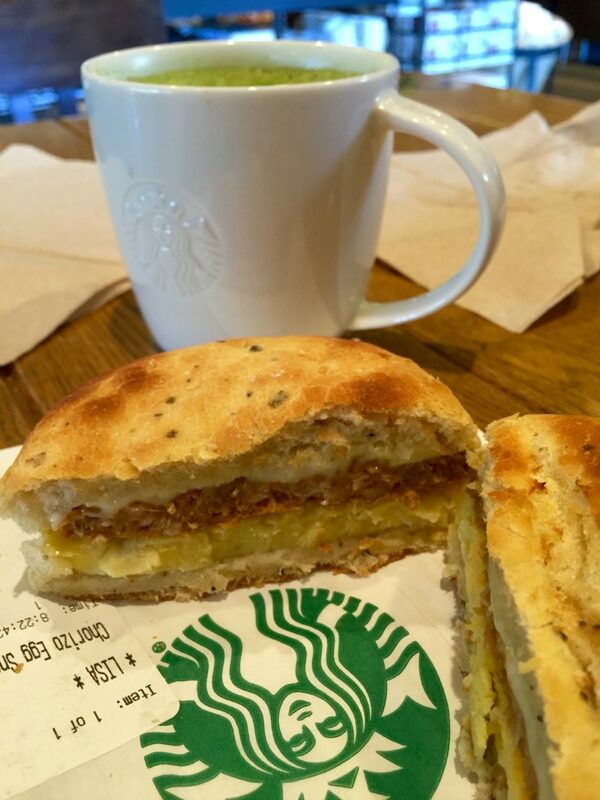 “Starbuckian food”… I love that!!! These new sandwiches are very tasty. I just had them both the last two days with the new macchiato latte with vanilla. Simply great combo. Ms melody, Thank you for the continued info. The Ancho-Chipotle Chicken panini is not intended to be a breakfast sandwich at all. It was launched as a lunch item and is listed on the menu as such (and would fall under any discounts on lunch items as well). I think they’re both delicious, though. It was time for Starbucks to add some spice to its life! I tried both sandwiches … both are very good.